Flydubai is recruiting Cabin Crew members for its Dubai Base. Anyone interested in this position can apply online. You can find more details here. The application is for “Dubai Assessment Centre”. After you submitted the online application, you will get an invitation for the interview. FlyDubai, which is owned by the Government of Dubai, is ready to expand its activity with new routes and currently they intend to hire new pilots and cabin crew members for their new fleet. -the ability to communicate effectively with a multi-national team of cabin crew. Apply online for this position here. Qatar Executive is to become the leading provider of jet aircraft charter services together with premier aircraft management, maintenance and handling services in the Middle East and around the world. – dedicated and energetic individuals to join the cabin crew team. Although most cabin crew will tell you that the greatest perk of the job is being able to travel the world, there are other unknown benefits that makes being one worth it. If you want a job that doesn’t just let you travel for free but covers a few other benefits as well then read on to know more! The aviation industry is now highly regulated to prevent work fatigue. Aircraft crews are given a set minimum and maximum range of how much they can work monthly. Since transporting people is a very important job, it only makes sense that the people manning the airline aren’t excessively fatigued to function. Pilots are allowed a maximum of 8 hours of flight time within 24 hours as outlined by the Federal Aviation Administration or FAA. Although there are a couple of hours provided for pre and post-flight preparations, it nonetheless pays more compared to the traditional 160 hours you might work at an office. If you love to travel, you’re probably a free spirit. If this is true for you, being micromanaged is probably something you’d prefer not deal with at work. As a captain or junior pilot, you won’t be managed onboard so it’s up to you to carry out your duties on your own initiative. Everyone has enough freedom on the team since each one has their own responsibilities to do. There are few other jobs out there that will allow you to meet a lot of interesting people. From athletes to politicians and celebrities to ordinary cool people, there’s a lot to discover in today’s pool of humanity. Even if not everyone you’ll meet will be kind, the ones who are will no doubt make a difference in how you view people. Another amazing aspect of the job is the free food and housing! When you’re traveling, it’s easy to get caught up in all the new sights and things you could discover that having at least two things off your mind can feel like heaven sent! Most airlines provide free housing to whatever location you’re currently based. Many also provide food allowance per day so you basically get free food! Aside from the standard travel perks, pilot salary is also higher than the national average. The job also comes with comprehensive health and retirement plans. The health insurance already includes dental and eye insurance as well as a profit-sharing program or a 401(k). Depending on your personality, there many other aspects of the job that you might also enjoy. Bigger airlines also offer other valuable perks like establishment and shopping discounts to level up your travel experience as you jetset around the world! Of course, being a pilot isn’t your only recourse to being an aircrew. Other aircrew jobs include flight attendants, flight engineers, and aircraft loadmasters, to name just a few. All of the said jobs require different qualifications and may vary a little in benefits as well. But for the most part, the above benefits ring true! 17 September, Hilton Rome Airport, Via Arturo Ferrarin, 2, 00054 Fiumicino, Rome, Italy, 9 A.M.
17 October, To be advised, Bari, 9 A.M.
You want to apply for a job in the clouds? You are passionate about aviation and you want to travel all around the globe? Here you will find the steps you need to follow in order to apply for your dream job, as a flight attendant. The airlines from the Orient usually require that you must reach 2.10m or 2.12m vertically, with your arm, barefooted, you may stand on your toes. Etihad Airways requires 2.10m whereas Emirates and Qatar Airways 2.12m. More information about it here. Swimming is compulsory for this profession, so if you are not able to swim, you should begin taking swimming classes. Generally companies accept tattoos as long as they are not visible when wearing the uniform. But bear in mind that there are companies like Qatar Airways, which does not accept any tattoos, even if they are not seen when wearing the uniform. Read more about the airlines’ policy on tattoos here. All airlines require fluency in English for their flight attendants, both written and oral. You must have a good level of English to be able to pass the interview. Your English skills are an important part of your training. As a future flight attendant, you will be the subject of a series of tests and medical examinations. Their purpose is to detect any possible disease or illness that could aggravate during flights. The only accepted diopters are +/- 4, provided you wear both glasses and contact lenses. These are the minimum requirements that a flight attendant should meet. In addition, each airline may impose its own rules on employment, so read the recruitment ads thoroughly. You need to keep an eye on the airline companies career website in order to see when they are hiring Cabin Crew. Here you can find the most searched airline companies for the position of Flight Attendant. The first thing the recruiters will see when you apply for the job is your CV and Photos. That will make the difference between being accepted or not. If you want to have your CV perfectly done you can send it to us in order to correct it. More details here. 2. Inform yourself about the airline and how the interview goes. Before attending an interview make sure you have informed yourself about everything it is to know of the company you apply to. Also you can look on our website and see how an interview day goes, what are the differences between open and assessment day and how to approach the recruiters. If you want to be extra prepared for Cabin Crew job you can attend one of our How to be Cabin Crew courses. We are also providing online private coaching with one of our trainers, which will give you the opportunity to prepare for an interview wherever you are. More details here. Good luck and hope to see you among the clouds! Prepare yourself for the upcoming interviews with the major airline companies. Attend one of our How to be Cabin Crew courses and make a step towards your dream. Details and registration here. Lili worked for 5 years as Cabin Crew for Etihad Airways. She left the company when she was pregnant with her first child, but she has flying deep in her blood. For her “nothing is hard for those who got their wings”. Lili is brave, she followed her dream and started working for Etihad Airways in 2008, when there weren’t so many information about this company in the Middle East. I was so excited to hear her story as it radiates passion and dedication. Nevertheless, Lili is a beautiful soul, a former amazing cabin crew. You worked 5 years for Etihad Airways. How was your first flight? Where did you fly? The first flight was extremely difficult, I was supposed to be an Observer during the flight, but I had to work exactly the same as the others in order to satisfy all the passengers requests, it was a very interesting experience for me. The flight was full, on a small airplane (A320). I must say that even before knowing about this job, I was passionate about the shows on National Geographic related to airplanes (Aircraft Investigations, Disasters in air). There may be a destiny, right? How was a day for an Etihad Airways flight attendant? A flying day was a real ritual, because it meant the same make-up, the same hair style, same uniform and a Briefing before each flight. After this, you will walk proudly with the whole crew under the starring eyes of the passengers. The flights were mostly tiring, but everything was fine as long as the crew knew how to communicate and work in a team. If this didn’t happen, the flight would be a failure, but each flight is a lesson. This job/world taught me to be grateful (for the fact that I was born in Romania and I had the chance to have an education, for the fact that I knew 4 seasons, and so on. ), I learned to be the best, to be patient, to respect different cultures, to accept that we are all what we are. Tell us a funny story of one of your flights. Hmm, there were so many. I remember on the second flight as an Observer when my colleagues along with the Captain tried to prank me. Ah, a whole flight laughed when the copilot forgot to deactivate “PA” (public announcement) and all the passengers heard their private conversation after landing. Have you ever encountered an emergency situation? How did you react? Fortunate, I haven’t had serious incidents in my 5 years as Cabin Crew. I once had a gentleman who fell in a deep sleep and his wife thought he died. In this kind of situations most important it is to remain calm, to talk with your passengers and to ask the help of your colleagues. In general, I am a strong person, I don’t panic and I manage to deal calmly with this kind of situations and to be useful when needed. Which was one of the great satisfactions that this job offered you? Seeing happy people: that hand shake when they left the airplane, that “thank you” in their language, the joy of offering a smile. And not least, the joy of seeing and living for a short period of time in all those places I had the privilege to arrive to. What will be the disadvantages of this job? Oh, the minuses…yes, they are plenty. Seen from outside, it is a wonderful job, and nobody knows what it truly means. It involves a lot of physical work, not only mentally, it is about working long hours, taking care of people, washing toilets if necessary, cleaning vomit and the list goes on. The idea is that from the moment you arrived in the airplane till landing, the airplane is your home, and from the moment the doors are closed till opening you are there for anything that the passengers need and trust me a lot can happen: babies can be born, people could die, accidents can happen, and so on. Do you miss flying? How is your life now? What plans you have in the future? Prepare yourself for the upcoming interviews with the big airline companies. Attend one of our How to be Cabin Crew courses and make a step towards your dream. Details and registration here. I think I checked the whole Facebook page and after that I went on the website. I read the whole website for days, then I thought, ok, I’ll apply for a course, why not? I have nothing to lose. So I made a paypal account and paid my course. For me was, ROME here I come! First time in Rome, first time in Italy. I was confused, will it help me? Am I made for the job ? Will there be a lot of students? Saturday, on 9th of July 2016, my course started at 11am. 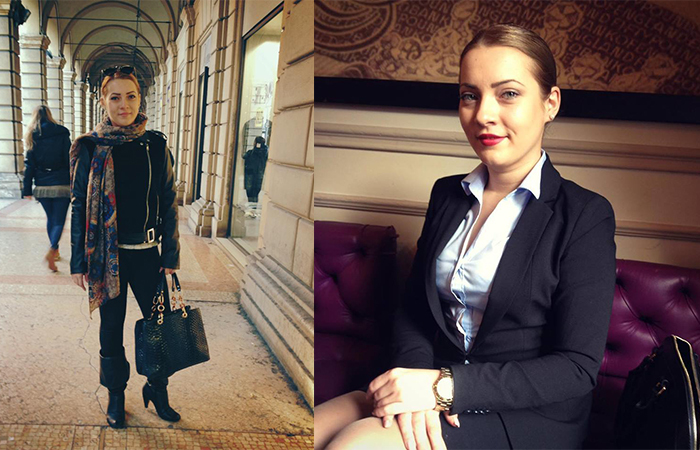 I received a warm welcome from Anca and Georgiana, the lovely How to be cabin Crew team. They were SOOO nice, I felt comfortable immediately. This course made me very confident also about my English, because English is not my first language, and my dear teacher Anca motivated to trust more in myself. I liked a lot the way she held the classes, how she taught us everything regarding the various interviews with airline companies, how she explained each step, how much attention she paid to each one of us. She’s a very elegant women, and motivates you to obtain the job. Spending time with her for me was like I was already on the plane. Now, after the course, I’m more motivated and I am feeling 100% confident. During the course, the word BRAVO of my dear teacher was a real BOOST. Also, through this course I discovered which are my skills and how to underline them better. I did not know I was creative until I heard this from my teacher. I would highly recommend this course to every person who wants to make his dream come true => BEING CABIN CREW . I’m sure I will get the cabin crew job soon, and will be soooo proud sending you a picture with me wearing my beautiful uniform. Prepare yourself for the upcoming interviews with the big airline companies. Attend our How to be Cabin Crew courses and make a step towards your dream job. Details and registration here.